I like coffee and kitchen tables when I write. When I write, it is often in the morning with Ed the cat. My kitchen and my favorite built-in bookshelves that my husband Todd made for me. I am making mole. Reading on the sailboat Bernard. Chilling on a park bench. My hand with my father's hand. My father is my first reader. The sailing vessel Bernard. Photo by Todd Everett. 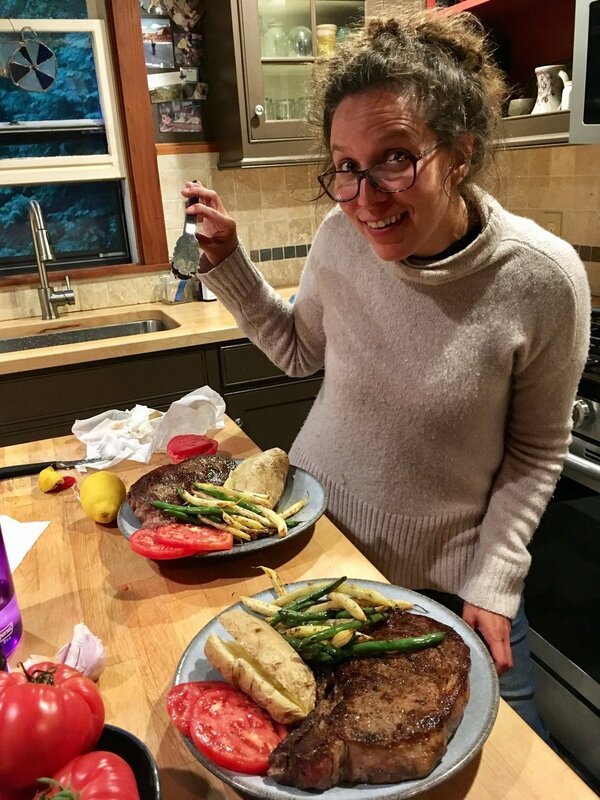 And lastly, here I am in a friend's kitchen making a gigantic meal after living on the sailing vessel Bernard for five months. Photo by Todd Everett. What is your most recent writing project / what is a piece you’ve had published recently? My most recently published poem is "Self Study as a Snow Globe." My father heard me read over the summer and said that when I read "Incantation on the Eve of 2017" it's like I’m trying to start a riot. This pleases me. The craft book I’ve read several times and is covered in marginalia is Stephen Dobyns’ Best Words, Best Order: Essays on Poetry. I just finished reading Tommy Pico’s Nature Poem, which I thought was incredible. It forced me to go back and listen to all my old Hole albums. In graduate school, a professor said that “just because it happens to you, doesn’t make it interesting.” I found that rather cruel and not particularly useful. But my favorite piece of advice is from Nikki Giovanni. She said, “there is no such thing as writer’s block, you just haven’t read enough." I don’t have a dedicated workspace, but I prefer to write at home, often at my kitchen table or on my bed where I can spread out all my books and papers. It’s quiet except for the birds, which I enjoy. I write in the morning. I like coffee. I don’t write every day but I definitely am always thinking about how to fix my poems. Many of my ideas are scribbled alongside my grocery lists. The first thing I do is put my glasses on and set a timer. I have presbyopia (an eye focusing problem) which makes typing and reading on a computer rather annoying. I like working and have worked in kitchens, retail, and currently in an English Department. Sometimes my work schedule gets frustrating, but it keeps me honest and out of trouble. I like having something else to do because poetry is pretty thankless work. I cook. No matter what is happening, I cook a good meal. This is the only thing that gives my life order, meaning, and constant pleasure. Honestly, time. I take a long time to write a poem and I can’t force this process along. I have to walk around with it, sometimes for years. Every year I do a series of erasure poems from a particular text on my website. I enjoy the challenge of trying to create something out of a very limited context. I like change. So, I try different things like living on a Peterson 34 sailboat for five months. I exercise. I listen to the Paris Review podcast. I walk around Schuler Books with my sister Nicole; which, if I had a zen state, that would be it.